“There are no extra pieces in the universe. Everyone is here because he or she has a place to fill, and every piece must fit itself into the big jigsaw.” ~ Deepak Chopra. Jigsaw puzzles come together like the order of our lives. We begin with the simplest of placement and a sense of achievement, though we recognize the challenge of arranging the most complex pieces. And similar to the jigsaw, tackling the simple parts are easy, but confronting the complexity of order may cause us a bit of bewilderment. We sort, sift, and shuffle the mysterious sections of a puzzle in an effort to place them where they belong, striving for that desired outcome. But what happens when we don’t achieve it? What becomes of us when our frustration dominates our sense our completion? At some time in our lives we have all experienced the kind of anxiety that makes us feel as if we don’t belong. We may feel displaced, tangled, even burdened. As well, we often forget that our experiences – all of them – are placed on our path to bring into being a much ‘bigger’ picture. Reflection allows us to pause, accept, and submit to this notion. When we surrender to our challenges and begin to view them as blessings – not blockages – we can begin to create the puzzle that has been designed exclusively for us. Puzzles are designed to be shaped, as are our lives. Many pieces of a jigsaw are constructed correspondingly like people – diverse and distinctive. We all employ a different method of approach. Like puzzles, we all have a significant structure; no two are alike. We all arrive with a divine set of directions and for various reasons. Once we comprehend that our uniqueness holds its’ own place on the Earth, we can see how the pieces of the puzzle fit into their perspective spaces. As creatures of habit, we tend to question everything that comes in our path. We devote considerable time to the assumptions of who, what, when, where, and how, forgetting that the journey is going to flow regardless of whether we’ve found the answer. Even when we are unconscious of the greater picture, God is urging us to move forward, giving confidence to our masterpiece in motion. I believe in divine order simply because it is the order of our every step. Divine order is the recognition of our reason, season, or discovery. It allows us to see how people, places, and things are positioned accordingly, be they a relationship, a job, relocation, or an unwanted occurrence. Divine Order is simply God’s way of ordering and arranging things and it is solid in its foundation. Just as patience is required to construct the pattern of a jigsaw puzzle, consciousness is required to understand what the past, present, and future can offer us. These jigsaws are designed to serve as road maps for order in our lives. Like footprints in the sand, the past shows us where we have been, but not yet where we are going. The past demonstrates the results of our decisions – for the good, bad, and indifferent. If we allow, perhaps it can decode many of those why’s, who’s, how’s, when’s and where’s, so that we are able to make healthier choices in the present and while moving forward. The present bestows us with instant moments to share, grow, and learn. It is the only moment we truly have, and one that grants us endless opportunities to witness the inevitability of change. As it proves time and again, all things in this life are transient, hence our need to lessen our attachments to people, places, and material things. The present moment grants us grace. It is a period in which we can embrace and be still. These periods of adjustment help us to understand that everything has a time and position: from birth to death, pleasure to pain, possessing to letting go. The future does not exist because it has yet to arrive. When we acknowledge that we are part of the divine and the divine is a part of us, we can accept the humanity of all things and the certainty of change. We can move forward and learn to live fearlessly and free from so much anxiety about the future. We are not granted a crystal ball to glimpse through, rather, an endowment of intuition we can always rely on to guide our path. 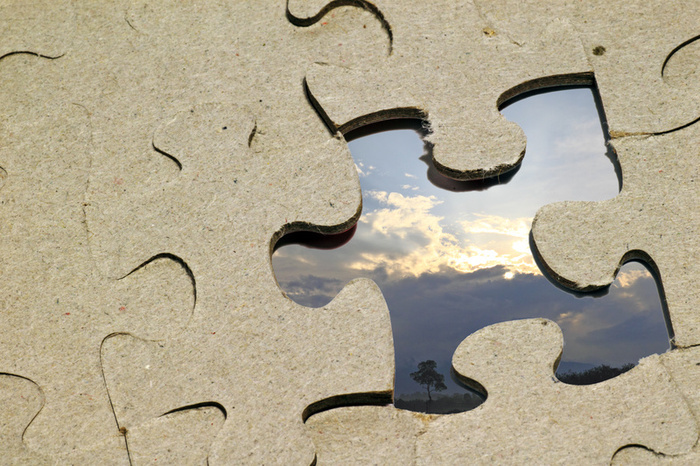 Life can often seem difficult to figure out like the pieces of a jigsaw puzzle, but there is a reason, season, and divine order for everything in its path. The challenges we face today and the challenges we will face tomorrow are elements that are meant to push us forward and reposition our growth. Not only are people placed in our lives for a reason or season – situations are too. Nothing in the universe is any more – or less – important than anything else because divine order is always at work. We may not be able to make sense of how the pieces of the puzzle fit or what the mean. Once we surrender and make a mental shift, we will be able to see how the pieces shape the puzzle of our lives. Learning to trust divine order helps us to better organize our steps – and our shape. Timing is everything. Now is the perfect time to choose to be stronger, wiser, and happier. Though I relax with excitement about the years to come, I bubble with great anticipation about the present moments. They are filled with humbleness, understanding, and gratitude. I am learning to meditate and dwell on the wonder of a world where issues don’t always have to be fully resolved before I allow myself to be ok because I realize that divine order is always in session. Reasons, seasons, and divine order bring clarity to our lives through rescue, restoration, and rebirth. Each new day affords a greater opportunity to begin again. Whatever is out of place in your masterpiece will soon come together. Weekly Affirmation: I trust my divine intuition.